Pilot study used enhanced biodegradation coupled with bioaugmentation to treat high PCE levels. High PCE levels above 5,000 ug/L were detected in groundwater. Regenesis optimized injection of the bioamendments into the target treatment zone. This project was located at an active dry cleaner in northern California. The site had elevated levels of PCE in groundwater due to releases over a period of approximately 60-years. 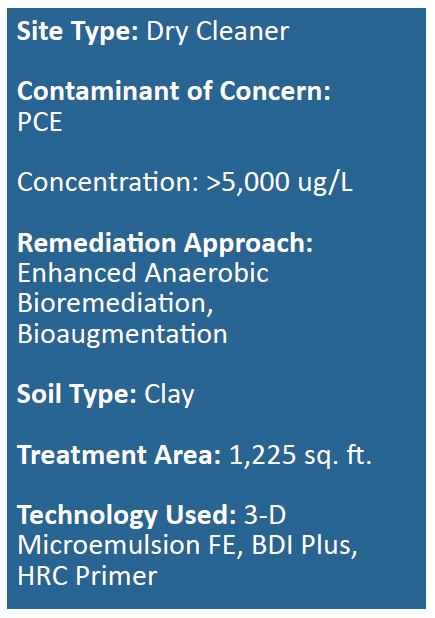 Enhanced anaerobic biodegradation (EAB) was chosen to remediate the site. A pilot study program was implemented using a combination of 3-D Microemulsion®, HRC® Primer and BDI® Plus. Significant contaminant reductions were observed within six months of the first application. An in situ EAB pilot study program was implemented to address elevated levels of PCE concentrations in middle zone groundwater just north of site. 3-D Microemulsion, HRC Primer and BDI Plus were applied through 15 bore holes to depths of 60 feet. Early injection attempts posed challenges due to the formation not accepting the required volume (surfacing). Regenesis provided a modified design reducing the amount of water needed for 3-D Microemulsion and suggested an alternative injection approach in the field which allowed for a more efficient injection within the target treatment zone. Bio-Dechlor INOCULUM® Plus is an enriched natural microbial consortium containing species of Dehalococcoides sp. (DHC). This microbial consortium has since been enriched to increase its ability to rapidly dechlorinate contaminants during in situ bioremediation processes.